Convenient and compact First Aid Kit. 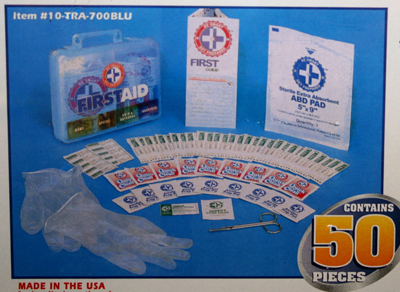 This 50 piece Kit is a smart way to start either your or a friends emergency preparation. Compact and lightweight make it ideal for placing in your car, office desk, or backpack or dorm room for easy access. Preparation is easy! 10- Adhesive Bandages Sheer Bandages, 3/8" x 1 1/2". 15- Adhesive Bandages Sheer Bandages, 3" x 3/4". 1- First Aid Instruction Guide. 1- Sterile Trauma Pad - 5" x 9". 1- Sting Relief Prep Pad.